Images and history of the Cambodian Flag. Provides facts and figures about Cambodia. There is also a good selection of maps that you can download, including BW outline maps. Welcome to KhLang (over weak)! Khmerang.Com - Be Khmer! Read Khmer! In Flash! Just discovered a wonderful blog, a good resource for adoptive parents with Asian children. It is called My Asian Heritage Blog. There's a post about the Sharing Foundation. COLLABORATION WITH THE LOWELL PUBLIC SCHOOLS. Tickets will be mailed to you. Check out this site - it's a Khmer Community in Ontario. conduct 14 workshops called “Personal Information Technology Workshop” at 14 different universities in Phnom Penh and Siem Reap with more than 1700 students participating. They are organizing the first "Cambodian Blogger Summit (aka Cloggers Summit)"
and Web2.0 tools) can make their study, work, and life easier. Cambodia. Even a donation of $20 will help. Make a donation. If 100 of my readers each donate $20, that will make the campaign successful! Forward the url to your colleagues and friends and ask them to contribute or repost. Have at least three or more new t-shirts from a tech or nonprofit tech organization? I'd love to pack them in my suitcase! Someday I hope that our family will be able to attend the Cambodian Heritage Camp - I've heard great things about it. It isn't in the cards this year, but maybe next year. Cambodian Heritage Camp is a family camp where campers from age 3 to 18, plus their parents participate in classes, workshops and family-oriented special events presented by Cambodian Americans, adult adoptees, professionals in the field of adoption, and the campers themselves, all of whom enthusiastically share their perspectives and expertise with adoptive families. More than 30 Cambodian American young adults serve as counselors, acting as warm and caring role models and mentors to the children as they participate with them in cultural classes. Adult family members attend cultural and adoption-related workshops ranging from Cambodian cooking to the blessings and challenges inherent in our adoptive families. Founded and run by adoptive parent volunteers, CamHC is one of ten camps facilitated by the highly respected Colorado Heritage Camps organization, which has been running heritage camps for adoptive families for 15 years. The goal of this film is to give insight into the lives of street children in Cambodia and to inspire viewers to support education for these impoverished youth so that their life conditions may improve. I watched the trailer and it looks like it will be beautiful film. Mongkol sent us this lovely New Year's card. We'd like to wish everyone a happy New Year! We hope to attend the celebration in Cranston, RI over the weekend and take photos and videos. 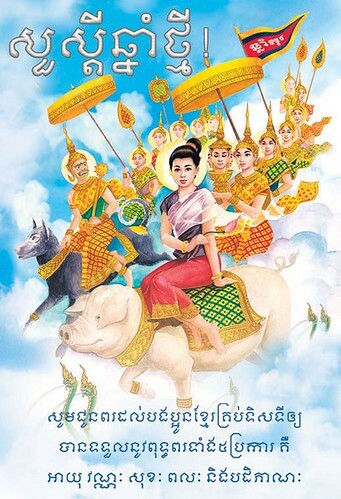 Meanwhile, enjoy this Cambodian New Year's video from last year and some more information about Khmer New Year's here. Hey, Beth. Do you know bloggers in Cambodia and other parts of Asia? Please could you help me invite them to join the Asia Social Media Directory. The Angkor Dance Troupe is having a dinner and show for family and friends on Saturday, April 21 to celebrate the Cambodian new year. This event will be held at Sompao Meas Hall, 450 Chelmsford Street, in Lowell. Tickets for adults are $25, and tickets for children, students, and seniors are $15. This is a casual affair, and dinner will be served Cambodian family style. Our dancers will also perform, including some of our newest, younger dancers! The evening will start at 6:00 p.m., dinner will be served around 7:00 p.m., and expect that the show will start around 8:00 p.m. For the late-night partying and dancing crowd, they're planning to have a DJ after the show, and the evening will end around midnight. If you're interested in joining the fun, please call the dance troupe's office at (978) 275-1823 or e-mail the founder and program director, Tim Thou, at tim@angkordance.org. If you are reader of this blog, you are probably aware of the campaign I ran to raise money for Leng Sopharath's college tuition using the ChipIn fundraising widget. 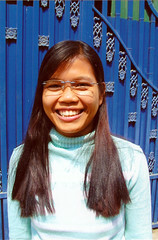 Leng Sopharath is one of 19 college students being sponsored for college through a program of the Sharing Foundation, an ngo that works directly with local officials, orphanages, and NGOs in Cambodia to identify and carry out projects which improve the lives of children. The photo above came in today's letter from Leng Sopharath. You can read see the other photos and read the letter in flickr here.